All parents...especially Mommy's...out there know how hard it is to travel with a baby, toddler, or child. Aiden has had 2 plane rides this year so far and numerous road trips. He just got back from a trip to Tennessee to see his Lubby and surprise his Great Gran for her birthday. She was DEFINITELY surprised at how big Aiden has gotten. Well next weekend Aiden and I will be back on a plane to Minnesota and the day we get back he is getting on the road to go to Hilton Head for the rest of the week!!! He is going to be wore out!!! His Uncle Raaj is graduating from High School in Minnesota and we would not miss that for the world. And the trip to Hilton Head is for the Douglass' annual family trip that happens during a medical conference that is held there every year. Now back to the ups and downs of traveling. Recently I purchased Aiden is very own piece of luggage!!!!! I got it from PB Teen (Pottery Barn)...rather than Pottery Barn Kids...because I wanted something big boy!!!! And boy is it...it is from their digital line. It was used for his trip to TN and it was PERFECT!!!! Now what I want is either a Maclaren Triumph or the Eco friendly UPPAbaby G-Lite. 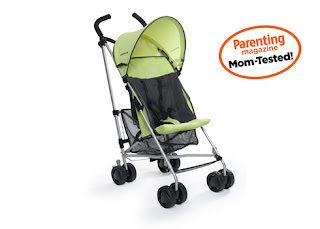 They are stylish umbrella strollers that would travel much easier than my Peg Perego P3 (that I LOVE LOVE LOVE). 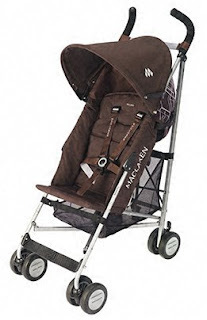 The MacLaren runs about $190 and the UPPAbaby is about $129, but I found a Maclaren on ebay for $110 that comes with two different covers!!! You can't that with a stick. Something else that makes it easier that I don't carry a purse anymore. I mean why should I? Aiden's diaper bag (from Pottery Bark Kids of course) is big enough to fit the whole world in!!! I normally check my bag and use Aiden's as my carry on (especially with the price to check luggage these days!!!! 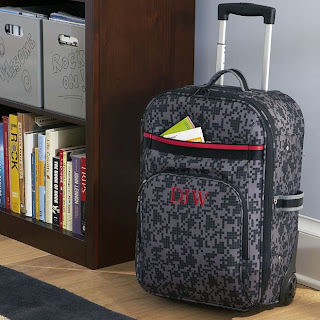 ), so just imagine me pushing my P3 that has a huge diaper bag attached to it, with a baby that does not like to stay in his stroller, pulling a piece of carry on luggage!!! OMG...by the time I get on the plane I am a mess!!! lol...My BFF and fellow Mommy Natalia told me to chuck the stroller for the airport and put Aiden in the sling (peanut shell) on my hip...now if I could just find his sling I would be golden.